Abstract. 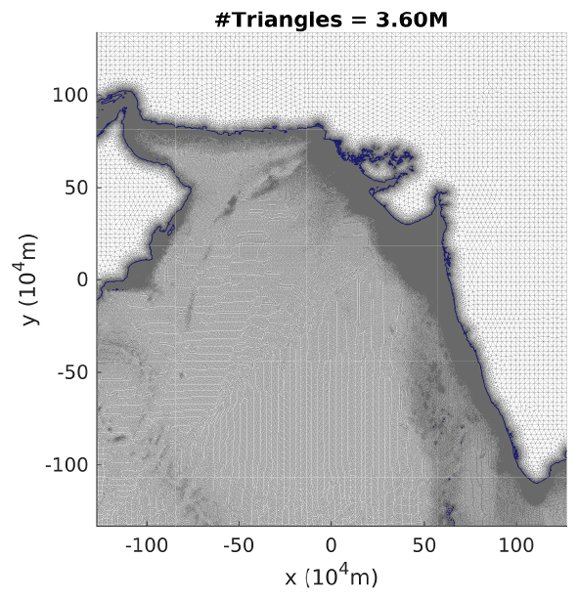 In this paper, we present the VOLNA-OP2 tsunami model and implementation; a finite-volume non-linear shallow-water equation (NSWE) solver built on the OP2 domain-specific language (DSL) for unstructured mesh computations. VOLNA-OP2 is unique among tsunami solvers in its support for several high-performance computing platforms: central processing units (CPUs), the Intel Xeon Phi, and graphics processing units (GPUs). This is achieved in a way that the scientific code is kept separate from various parallel implementations, enabling easy maintainability. It has already been used in production for several years; here we discuss how it can be integrated into various workflows, such as a statistical emulator. The scalability of the code is demonstrated on three supercomputers, built with classical Xeon CPUs, the Intel Xeon Phi, and NVIDIA P100 GPUs. VOLNA-OP2 shows an ability to deliver productivity as well as performance and portability to its users across a number of platforms. How to cite: Reguly, I. Z., Giles, D., Gopinathan, D., Quivy, L., Beck, J. H., Giles, M. B., Guillas, S., and Dias, F.: The VOLNA-OP2 tsunami code (version 1.5), Geosci. Model Dev., 11, 4621-4635, https://doi.org/10.5194/gmd-11-4621-2018, 2018.